Posted in Island Batik on January 5, 2017 by Barbara. Posted in Island Bakik Pumpkin Fest, Island Batik on November 1, 2016 by Barbara. Autumn is in the air, with fall colors dotting the sky line. My Autumn Tree is now available in The Quilt Pattern Magazine October 2016 issue . This is a perfect project for young or novice quilters that has a lot of colorful punch. Posted in Island Batik on October 6, 2016 by Barbara. Summer is always a challenge to get any sewing done, Island Batik's July challenge- holiday or winter in July, was the theme. I chose to do a 15" table topper that can be used as a hot-pad for a casserole pan with Insul-Bright and Warm&White batting. This snowflake-esque block is called Winter Fleur. It is a design that Mary Warner-Stone and I collaborated on for The Quilt Pattern Magazine's July 2016 Issue. Posted in Island Batik on July 13, 2016 by Barbara. 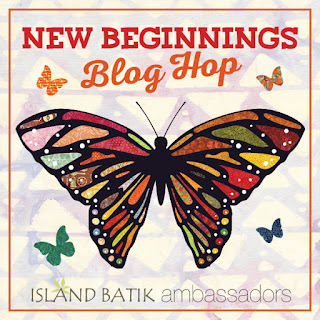 This month's Island Batik Ambassador's challenge is Modern Batik. Urban Squares© is my contribution to this fun challenge. As you can see I have not yet finished Urban Squares© quilting. It has been a total 'challenge' to be able to make the time to sew with so much summer family activities, deadlines for 3 patterns for The Quilt Pattern Magazine, as well as health issues. I do look forward to sharing the finished project and announcing the pattern availability in Stone Cottage Design's Craftsy store. Please be patient! This one is fast and fun, unless you are me! Posted in Island Batik on June 29, 2016 by Barbara.